In Midtown Muskegon, life is good. Where once there were abandoned buildings, shops and restaurants are opening. People who left the city are coming back to start businesses. Third Street is rising. Perhaps like Muskegon itself, Third Street has never been easy to define. Its denizens, past and present, are proudly diverse: business owners originally from Vietnam and India, restaurateurs from Houston and New Orleans, artists who grew up in Muskegon. Its visitors too have been an eclectic bunch, with the street being filled by everyone from politicians—legislators from throughout Michigan attending the 1892 Democratic State Convention, for which a gathering space was built on Third Street—to crowds at the countless shows played at the Ice Pick, a club that once attracted punk fans from across the region, and country, for a little more than two decades, beginning in the mid-1980s. Businesses there have ranged from the Walt Plant Television & Appliances Store, run by generations of the Plant family for 118 years at 1119 Third St., to restaurants offering ethnic food that can otherwise be difficult to find in the city (like Valy Vietnamese Oriental Food, Gifts & Market, Curry Kitchen, and Naan Pizza, all of which are there now). Third Street’s residents, patrons, and owners have celebrated the openings, and mourned the closures, of businesses and nonprofits; they’ve been a part of a Muskegon that has gone from an economy heavily rooted in industry to one that’s increasingly diverse. The section of Third Street now known as Midtown (the area from Muskegon Avenue to Jefferson Street) saw its buildings spared from the demolition that knocked down the historic structures that once dotted streets like Western Avenue to make way for the Muskegon Mall in the 1970s. And they’ve seen these Third Street buildings in Midtown empty and full, abandoned and boarded up, and, now, once again, brimming with life. Businesses lining Third Street in Midtown Muskegon are thriving. Midtown has been inextricably intertwined with Muskegon’s past, present, and future, but the area has also long been its own unique enclave, a walkable stretch of land in the downtown Nelson neighborhood. It shares space with both commercial venues and residences alike, the street lined with century-old brick buildings and colorful homes filling pedestrians’ sight lines with yellow, blue, and green walls—backdrops to porches that, for years, have held guitarists plucking strings into the night and July 4 barbecues and children’s birthday parties and all of that which we call life. 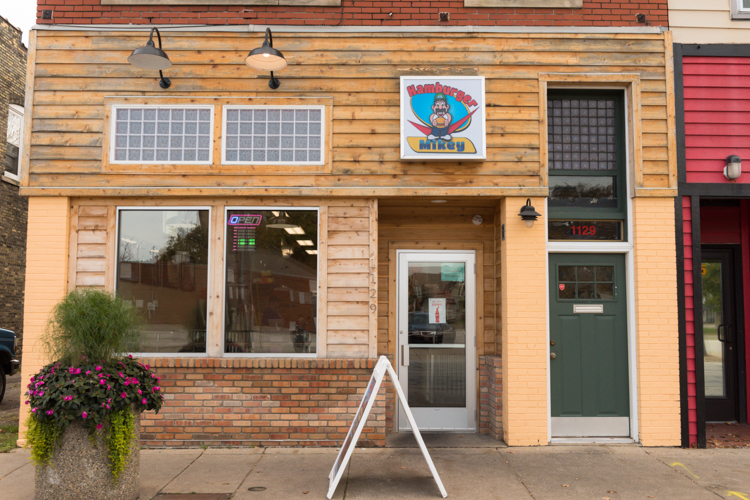 Like much of Muskegon, Midtown's Third Street has been called “gritty,” a descriptor that, while sometimes used as a negative euphemism by those blind to the pulse and vibrancy of city life, has been embraced by the area’s business owners and residents. After all, Third Street has seen its fair share of ups and downs, owners and residents explain; it has faced shuttered shops and boarded up buildings—and it has always found a way to not just hang on, but, ultimately, to thrive. Cornerstones like Valy Vietnamese Oriental Food, Gifts & Market, which has been operating for more than a decade, and Curry Kitchen, which debuted in 2012, have paved the way for other successful shops, a series of which have celebrated their openings over the past year: Naan Pizza, Hamburger Mikey, Third Coast Vinyl, and Shop SZN. The Muskegon YMCA relocated to Third Street in 2016, and The Griffin’s Rest, a gaming store, hopes to open around Thanksgiving. Property owners too have big plans for the area, including the redevelopment of the Matson Oldsmobile dealership, a massive property that spans much of the street across from the new shops, and the 20,000-square-foot property at 1185 Third St. potentially becoming a hub for local vendors—think something akin to the Union Market in Washington D.C. In other words: Third Street is rising. 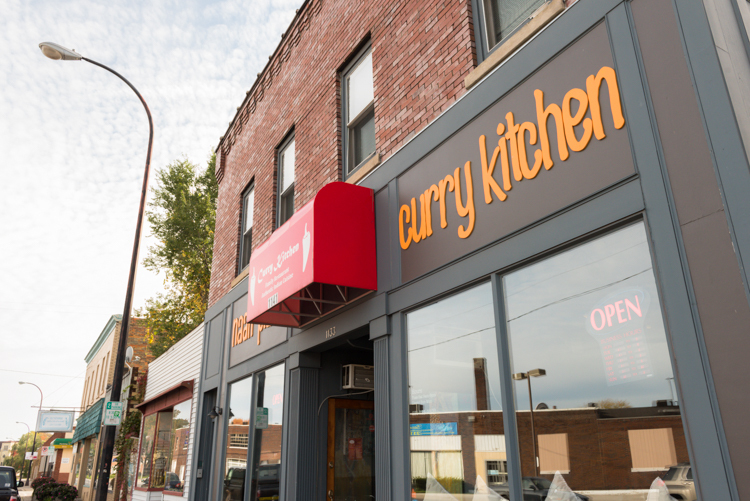 Five years ago, Raj Grewal and his wife, Kismat Grewal, decided to open Curry Kitchen at 1141 Third St. in an effort to expand options for ethnic food in the community. 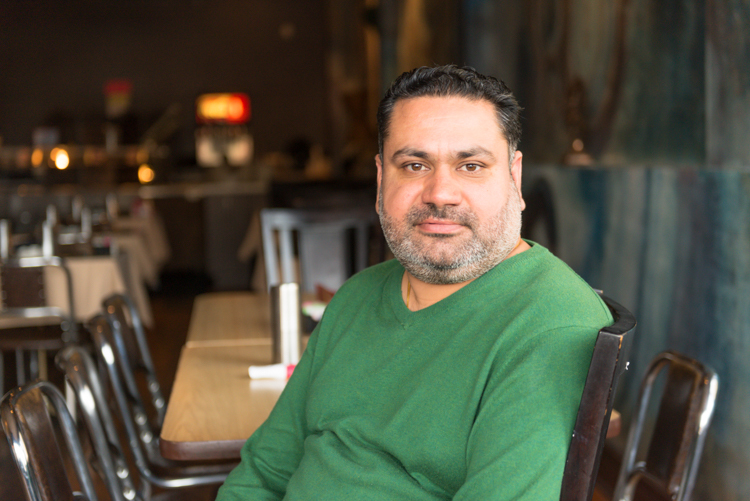 Raj Grewal owns Curry Kitchen and Naan Pizza. “When we came to Third Street, it was pretty empty,” says Grewal, who, along with his wife, is originally from Punjab, a state in northern India. 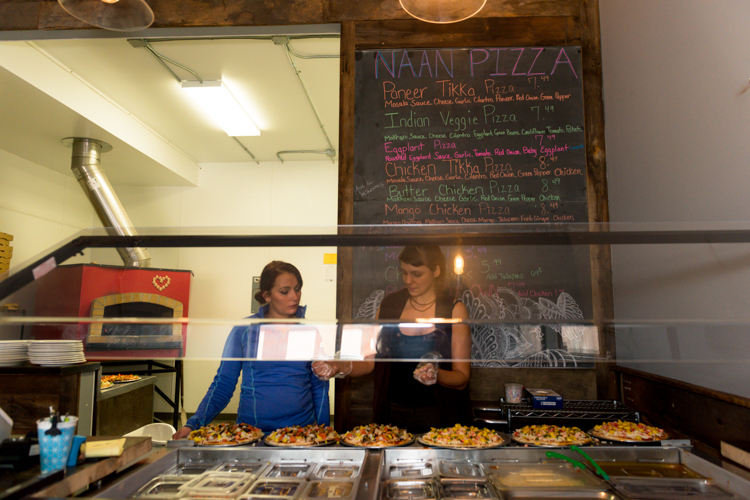 Tessla Smith, left, and Amber Brown prepare pies for the dinner rush hour at Naan Pizza. 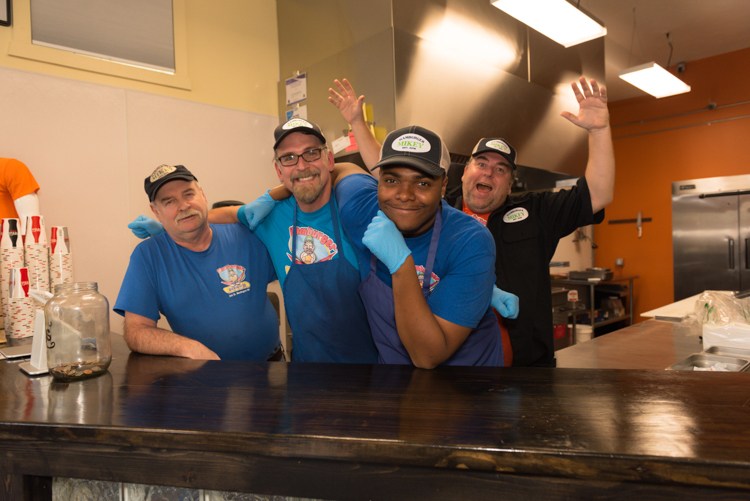 The Grewals, who live in Muskegon and also own the Curry Kitchen in Grand Rapids, had so much success with their restaurant—a place of vibrant blue walls and the tantalizing scents of cumin, coriander, and saffron wafting from the kitchen—that they decided to open another business next to Curry Kitchen, Naan Pizza, seven months ago. 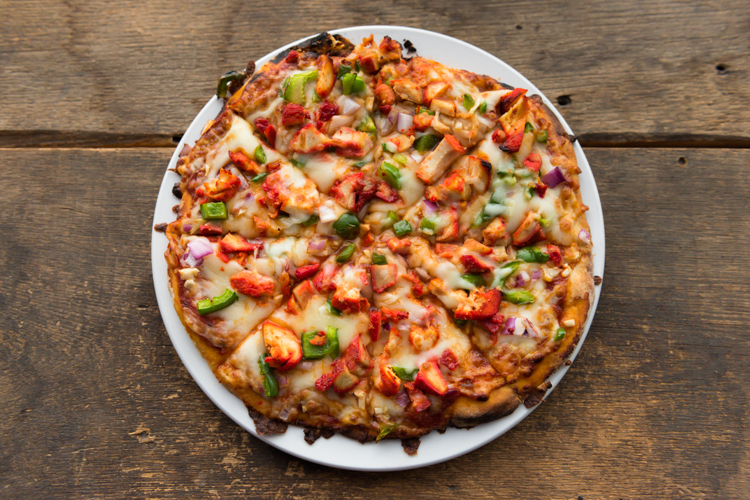 The butter chicken naan pizza. In addition to his businesses’ own growth, Grewal is thrilled with the movement he sees happening along Third Street in general. When Tim Taylor and his step-father and mother, Mike and Mary Jane Burling, bought the building at 1129 Third St. five years ago, they weren’t yet sure what their plans were for the space that was once The Ice Pick, a spray painted, all-ages punk haven that had its heyday in the 1980s and '90s. But the family knew their city was “on its way back, and we wanted to be a part of that,” says Taylor, a native of Whitehall, Michigan who has lived in Muskegon for the past 12 years. Plus, Taylor explains, he and his parents were thrilled to purchase a piece of Muskegon history. “Huge acts came through The Ice Pick; you’re sitting in the most iconic building in Muskegon,” Taylor says. Hamburger Mikey is about to celebrate its one-year anniversary. As the three owners were trying to “figure out something that would fit in this neighborhood,” they ultimately decided upon a business that embraced the traits they loved about Third Street: no frills, filled with community and laughter (and sometimes even dancing), supportive of everyone who came their way: attorneys from the nearby Muskegon County courthouse, parents and young children who live in the neighborhood, teenagers from Muskegon High School, surgeons from Mercy Health, culinary students from Baker College, Muskegon Lumberjack fans, and many others. So, on Nov. 22, 2016, Hamburger Mikey, named after Taylor’s step-father, was born. Now, almost a year later, Hamburger Mikey, an old-school burger and fries joint that gets their beef from Meat Block, a family-owned business that’s been in Muskegon for a little over a century, has served up about 36,000 burgers. And their accolades are coming fast and furious: the Muskegon Lakeshore Chamber of Commerce named the restaurant one of nine “agents of change” in the city, they’re a finalist for the much-coveted Celebrated Service Award (public voting for that begins Nov. 8), MLive ranked them in Michigan’s top 10 for the state’s best french fries, and, just five months after opening, they landed second place for best dish at this year’s Taste of Muskegon. 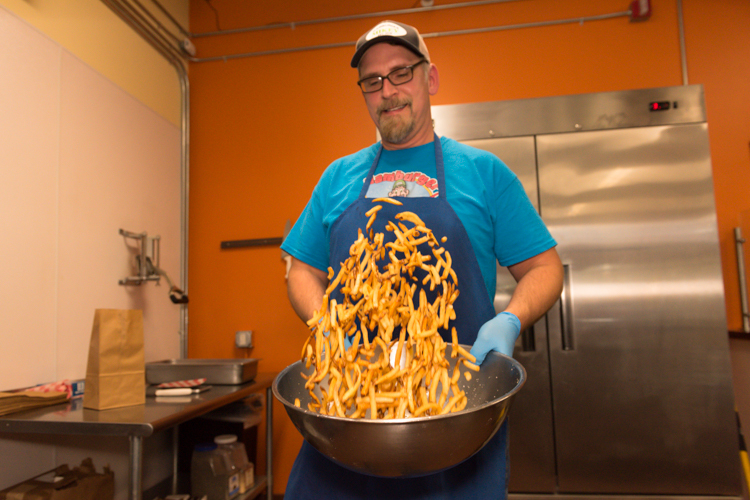 Tim Taylor works his magic on Hamburger Mikey's fries. 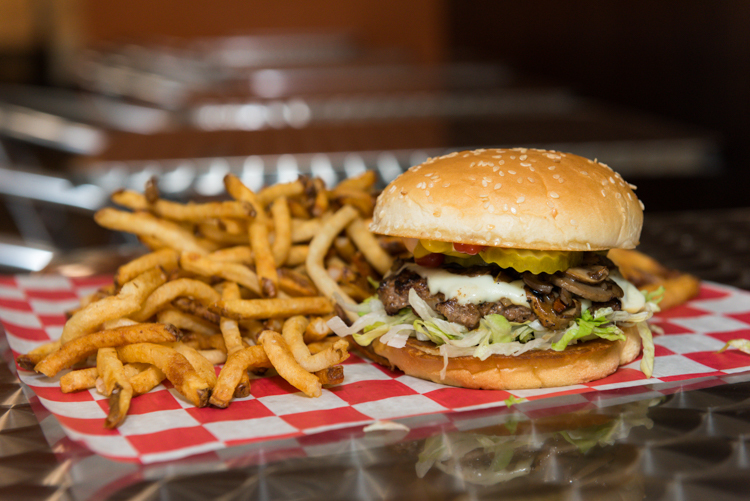 Hamburger Mikey has served more than 36,000 burgers since it opened almost one year ago. “It’s thanks to the amazing staff we have,” says Taylor, who lives in the apartment above his burger joint and previously worked at Mia & Grace. While Mia & Grace has shuttered, the couple behind the restaurant, New Orleans and Houston natives Jamie and Jeremy Paquin (who’s now the head chef at Grove in Grand Rapids) remain close with their old neighborhood, and Jamie designs Hamburger Mikey’s burger of the month—concoctions that range from October’s cordon bleu with house made blue cheese sauce, seared ham, and a beer onion bun to November’s Thanksgiving burger, which includes seared turkey, cranberry sauce, and a bun partially made of stuffing. As for the staff, it’s clear they love their owners; Taylor, the Burlings, and the employees are a tight-knit group. Jerry Maxwell, an employee who’s been involved with Hamburger Mikey since the beginning, and Taylor have even recently acted together: the two are now in a horror movie, “Ruin Me,” which was filmed in Muskegon and has been making the rounds at film festivals across the world, from Austin to London. “People used to be scared to come up this far from downtown, but they’re not anymore,” Maxwell, a California native who moved to Muskegon in 2005 and has since purchased a home in Muskegon Heights, says in reference to Midtown, located about half a mile from the downtown shops along Western Avenue. “We really helped to clean up the area; we put in extra garbage cans,” Maxwell continues. Hamburger Mikey's owners and employees are a tight-knit (and pretty much always hilarious) group. This resurgence in business, both in Midtown and in Muskegon’s downtown in general, has brought a new energy to the area, Taylor and Maxwell say. Music runs in Paul Pretzer’s blood. A self-taught guitarist—he and a friend bought a couple of guitars, put on a Ramones album and learned to play—Pretzer has played in a series of bands stationed in Muskegon, including Jim Jones and the Kool-Ade Kids, a punk rock group that played at The Ice Pick; managed record stores in the 80s and 90s; and collected albums for as long as he can remember. He's able to pretty much wax poetic on any music genre, band or singer, whether you want to talk obscure jazz or chart-topping rock. Ask him about his favorite music, and he’ll groan. 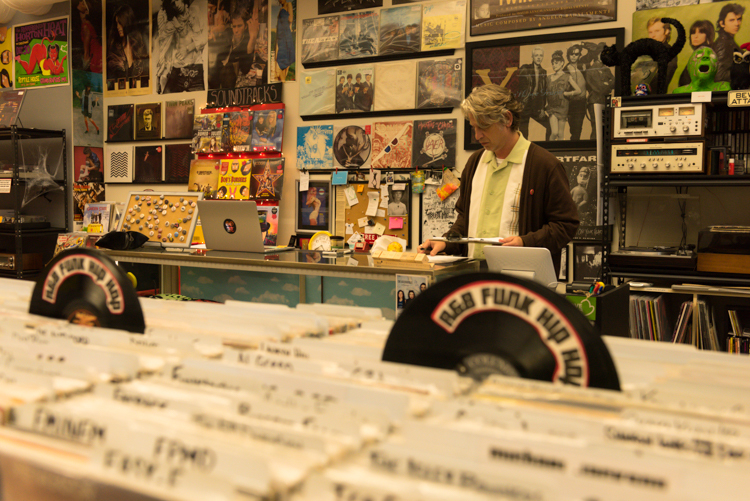 Paul Pretzer, owner of Third Coast Vinyl. All of that is to say: it is not surprising that Pretzer is running a successful record shop, Third Coast Vinyl, at 1115 Third St., a building owned by the nonprofit Pioneer Resources. 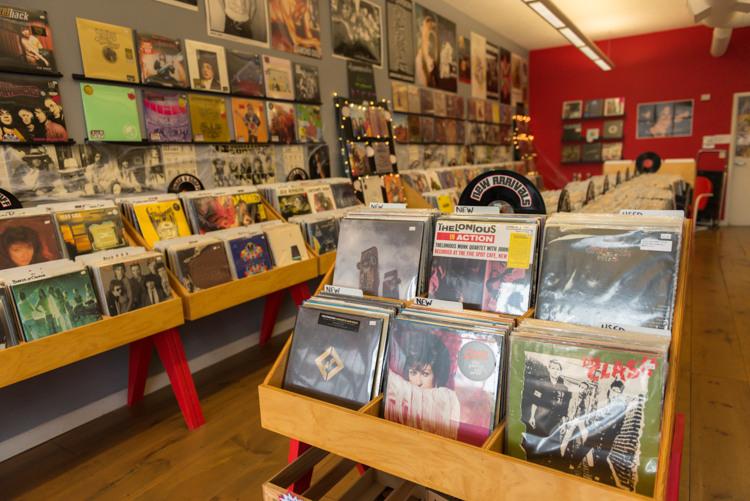 That “something different” has translated to a thriving record store that, like all of the other stores along Third Street, has been warmly embraced by the community. “The reaction from Muskegon has been great,” Pretzer says, standing against the shop’s bright red walls inspired by “Twin Peaks” (also, for all of you David Lynch fans, be sure to look for the Agent Cooper artwork adorning the wall by the cash register). 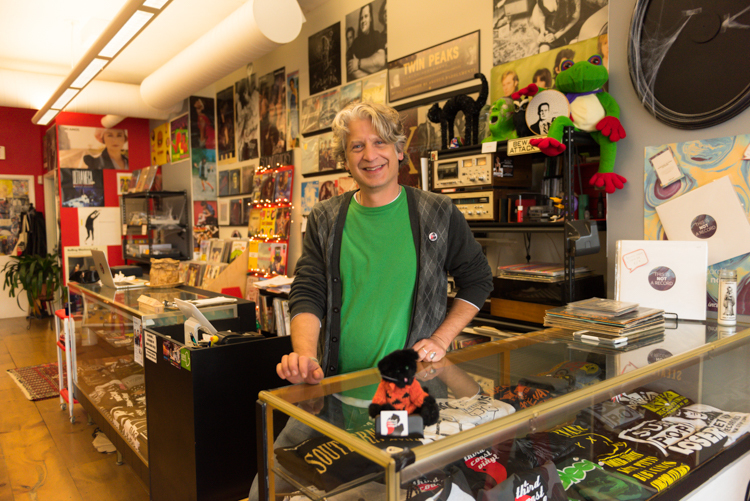 “Especially in those first months, people would come in and say, ‘Thank you for opening here.’ Not just for opening a record store, but for being part of the things happening here in Muskegon. People are grateful that businesses are opening up here. The music community too is growing, Pretzer says. 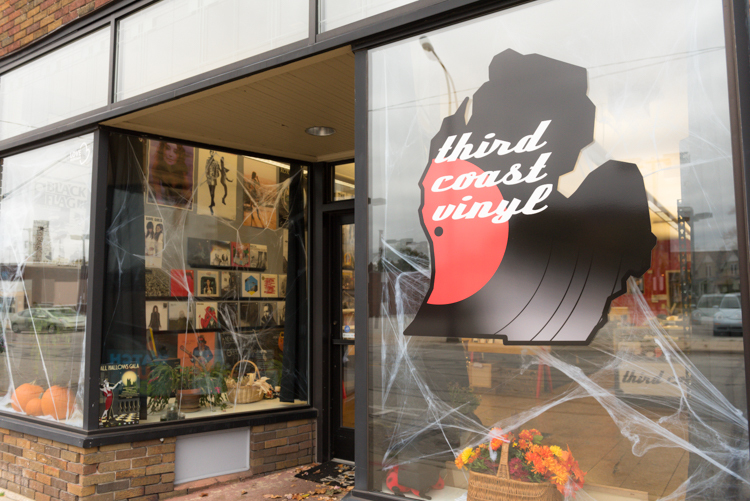 Third Coast Vinyl opened just over one year ago on Third Street. Looking to the future, Pretzer says he imagines expanding in-store events, such as live music performances and poetry readings, as well as an increasingly cohesive business community. And, the shop owner says, he’s excited to see Third Street, and Muskegon, continue to grow. Kevin Malone, owner of Shop SZN. 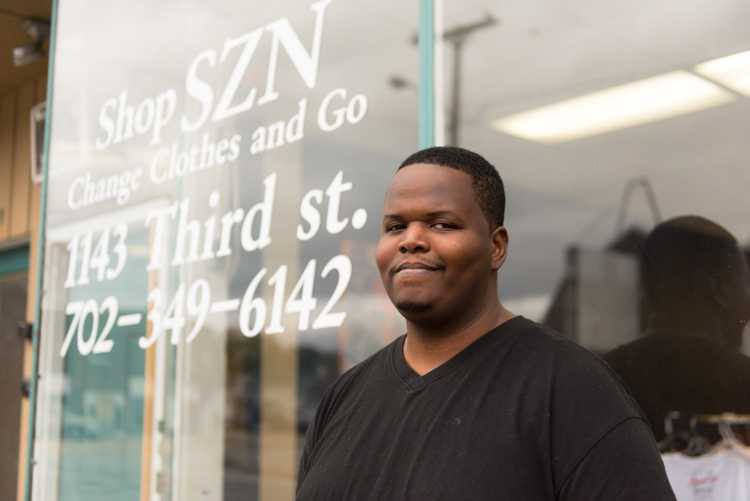 When Kevin Malone, a 2007 Muskegon High School graduate and current Nuvo Cosmetology school student, opened Shop SZN (pronounced “shop season”) at 1143 Third St. this past May, he was moving into a building that had sat entirely empty. “It was 1,400 square feet of open opportunity,” says Malone, who, in addition to running Shop SZN and being a full-time cosmetology student, has a background in art and design—something that is particularly helpful when it comes to his business, which offers custom screen and vinyl printing. 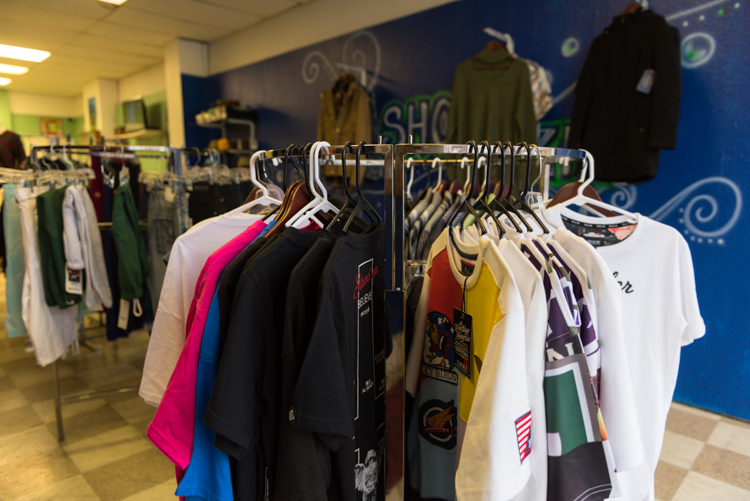 It also sells clothing (including several brands from local designers, such as Parachute Gear out of Grand Rapids and Cop ‘n Go from Muskegon), accessories, and music. Beginning in 2018, Malone expects to open a full service salon in the shop. Shop SZN made its debut this past May. 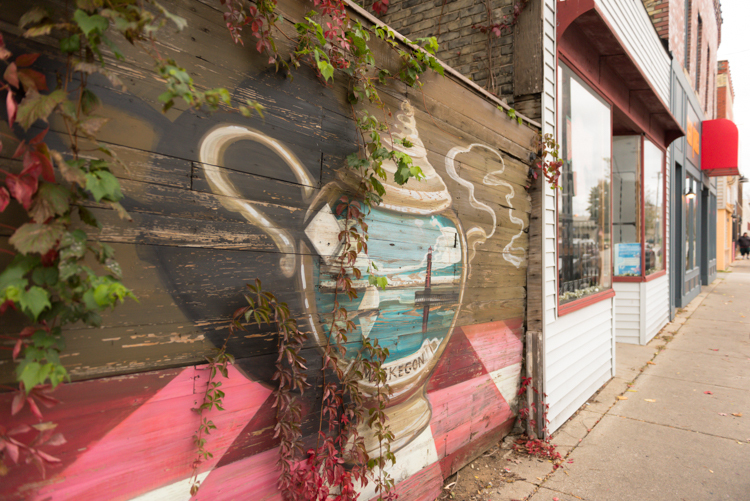 Hoping to inspire others in Muskegon’s creative community, Malone is focusing on the shop not just being a commercial venue but a space where artists, designers, and musicians can gather. “It’s an artistic store,” Malone says. 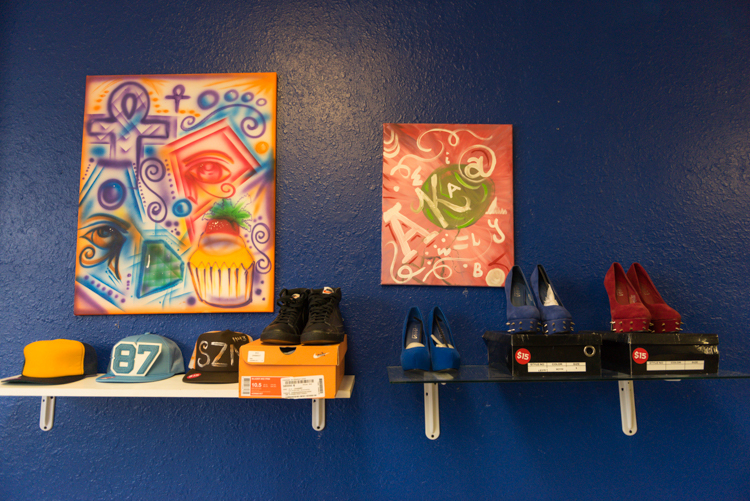 “I did the artwork in the store, and the color scheme of the shop is blue and green, which represents balance, harmony, growth, and stability." Ultimately, Shop SZN is about being “empowering, innovative, and creative,” explains Malone, who, like his neighboring shop owners, is inspired to be a part of a growing city. Eventually, Malone says he’d like to expand Shop SZN to other cities. Get ready to fly your nerd flag. 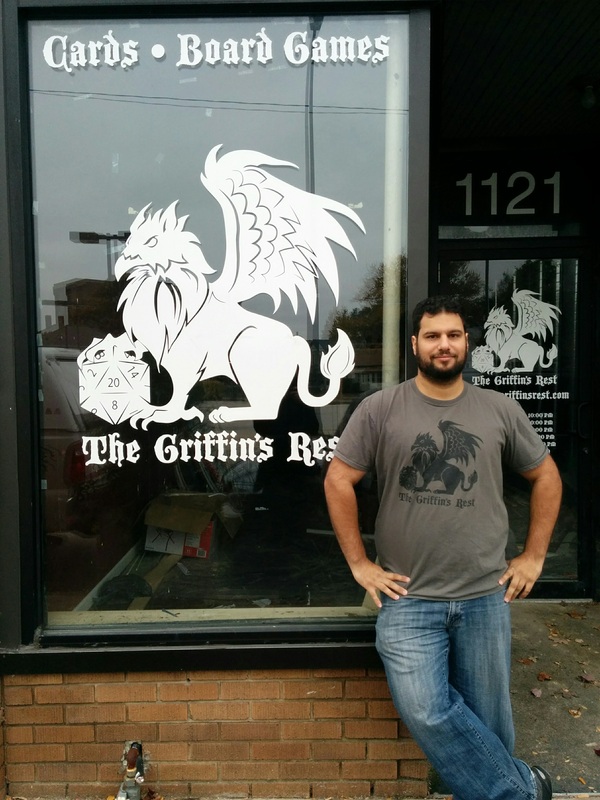 The Griffin’s Rest is set to be the newest addition to Third Street, and the incoming gaming shop will offer two floors of space for Muskegon’s large and growing “nerd community,” owner Kiel Reid says. “In Muskegon, we know there’s a big nerd community: people into comic books, fantasy, board games, and they don’t have a place to congregate or purchase things the day of,” says Reid, who grew up in downtown Muskegon, graduated from Muskegon High School in 2004 and recently moved back to the city after living in Chicago for about a decade. 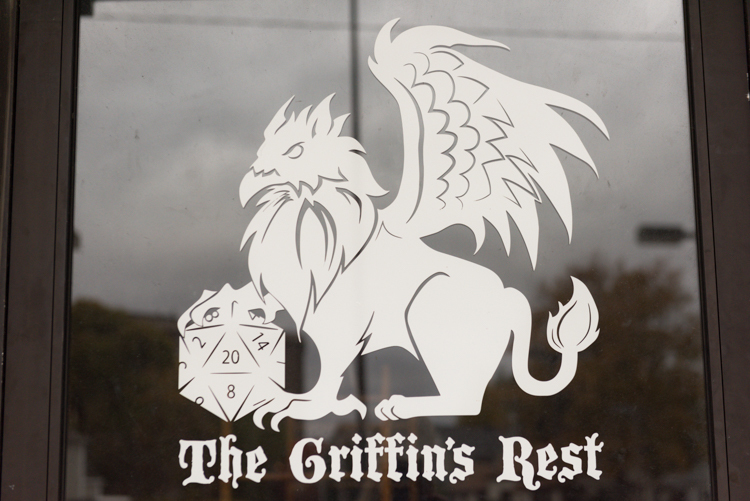 Ultimately, Reid hopes The Griffin’s Rest, which is expected to open sometime around Thanksgiving following extensive renovation work on its 100-year-old building, will “build a strong community for the gaming community." “We want to have a space where people can have their nerd flag fly,” Reid says. The store will consist of two floors, with the downstairs selling a variety of merchandise—including board games, comics, cards, miniatures, and more—and the second floor offering several rooms where people can play games and hang out. People from all walks of life will be welcome at the shop, and Reid has no doubt there will be a diverse crowd. “Gaming is a big spread of different people: people in corporate jobs, kids who just got out of high school and are struggling to get by. They’re at the same table, enjoying the same game,” says Reid, who’s hoping to sponsor gaming clubs at local schools and offer a welcome environment for neighborhood teens. A self-described jack-of-all-trades (Reid has been involved in landscaping, telemarketing, street sweeping—he’s done “almost everything but own a game store”), he’s excited to bring his business acumen and gaming know-how to a store and a community that he’s incredibly passionate about. “When I was growing up, it was difficult to find a job for just about anybody,” Reid says. “There was no sense of urgency to make Muskegon grow at that time, around 2004. People were struggling; they were trying to hold on. We didn’t know what we wanted to be. Over the past five years, Muskegon has decided we’re gonna be a great place for people who live here and for people who visit us as well. That’s a challenge for any city, but I think Muskegon’s pulling it off. A mural on Third Street. Increasingly, investors and developers are turning to Midtown, and there are a series of properties in the neighborhood that are slated to become significant projects in the years to come. Steve Carey, a native of Ada, Michigan who’s now working in government affairs and business development in Washington, D.C., purchased the expansive 20,000 square foot brick building at 1185 Third St. this past summer, and he has big plans in mind for the historic property that has been part of the community for more than a century. Carey, a U.S. Marines Corps veteran who has also invested in residential properties in Muskegon, first started thinking about investing in the city upon seeing a talk on the blue economy by Dr. Alan Steinman, director of Grand Valley State University’s Annis Water Resources Institute. The blue economy refers to an economy that’s tied to the water—right now, one in five jobs in Michigan is connected to water industries and that’s expected to grow. At 1185 Third St., Carey says he’s thrilled with the historic aspect of the building. While specific plans for the site have yet to materialize, Carey says he’s set on preserving and celebrating the building’s history. “I wish we could keep in mind that these buildings tell stories. Muskegon tore down a lot of history and memories decades ago,” Carey says, referring to the demolition of many of the downtown buildings to make way for the Muskegon Mall in the 1970s. “I just love this building on Third Street, and I’m happy to be part of the resurgence happening in the city,” he adds. 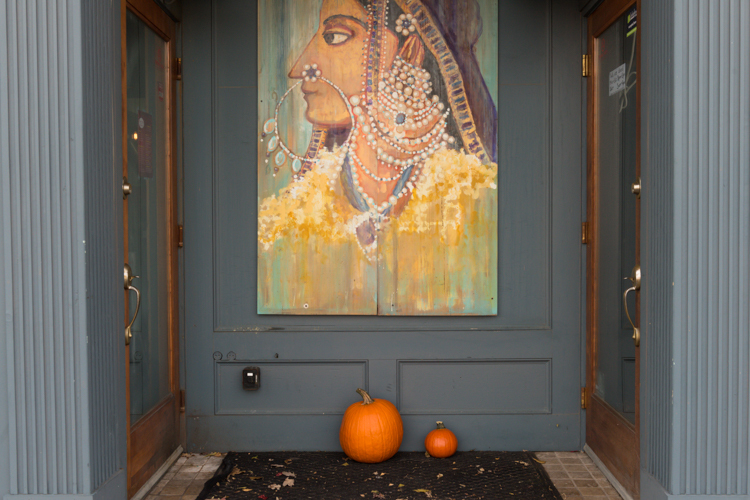 A painting decorates the space between Curry Kitchen and Naan Pizza, businesses in a building owned by Kathy Dennison Adrianse. Another major player on Third Street is Kathy Dennison Adrianse, who owns 1121 Third St., where The Griffin's Rest will be, and 1133 Third St., where Naan Pizza and Curry Kitchen are located. Dennison Adrianse’s company, Lighthouse Property Management, too has made a significant investment in Muskegon in recent years. First introduced to Muskegon five years ago, when she and her husband were looking for a place to go boating, Dennison Adrianse says she quickly became enamoured with the city. “My husband and I were driving through Muskegon, and we fell in love with the port and channel and lake and beach,” she says. “Then, we started going into different restaurants, and the people we met were so nice. We purchased a second home in Muskegon. As for the future of Third Street, Dennison Adrianse says she’s looking forward to the redevelopment of the long-shuttered Mattson Oldsmobile dealership showroom and office at 1144 Third St., a property that takes up much of the space located across the street from shops like Curry Kitchen and Hamburger Mikey. Brad Martell, of Grand Rapids, owns the property. Jodi McClain recently won six free months of rent at 1144 Third St. and expects to open her spa, East of Eden, there in the near future. Even with the spa, there will still be significant room left for development. “It’s cool because Midtown is very gritty and very grassroots,” she continues. “Everyone there, we’ve become very good friends. We care about each other." This story is part of Rapid Growth's "On the Ground-Muskegon Lakeshore" series, which aims to amplify the voices of the community members who make up Muskegon's waterfront neighborhoods. Over the next three months, our journalists will be embedded in the city's lakefront communities in order to dive deeper into topics important to residents, business owners and other members of the community. To reach the editor of this series, Anna Gustafson, please email her at AKGustaf@gmail.com, or connect with her on Facebook. Support for this series is provided by Downtown Muskegon Now, the Muskegon Business Improvement District, the Muskegon Lakeshore Chamber of Commerce, the Michigan Economic Development Corporation, Pure Muskegon, Watch Muskegon, and the Community Foundation for Muskegon County. Photography by Jenna Swartz unless otherwise noted. To connect with Jenna, visit her website and Facebook page. Hours: 11am-3pm and 5pm-9pm Monday through Thursday; 11am-3pm and 5pm-10pm Friday and Saturday; 12pm-3pm and 5pm-8pm Sunday. Contact:Call (231) 571-9777 or visit them on Facebook. Contact: Visit them on Facebook. Hours: 11am-8pm Monday through Saturday; closed Sunday. Contact: Call (231) 724-3008 or visit them on Facebook. Hours: 11am-9pm Monday through Saturday; closed Sunday. Contact: Call (231) 725-0777 or visit them on Facebook. Hours: 10am-6pm Monday through Thursday; 10am-8pm Friday and Saturday; closed Sunday. Contact: Call (702) 349-6142 or visit them on Facebook. Hours: 11am-6pm Monday through Thursday; 11am-7pm Friday and Saturday; closed Sunday. Contact: Call (231) 288-1871 or visit them on Facebook and Instagram. Hours: 9:30am-7pm Monday through Saturday; 11am-5pm Sunday.